Intimidator UTV vs Truck: Which is the Best Hunting Vehicle? | Intimidator Inc. When it comes to hunting, it’s important to have the right gear and tools needed for the sport. From the rifle to the camo gear to the ammo, everyone has an opinion on what’s BEST and what you should purchase. And when it comes to the best way to get to your hunting destination, opinions are all over the place. Some hunters say to just use your truck while others argue that UTVs are the only way to hunt. Which is the best hunting vehicle? The Intimidator UTV makes a great hunting companion and here is why! 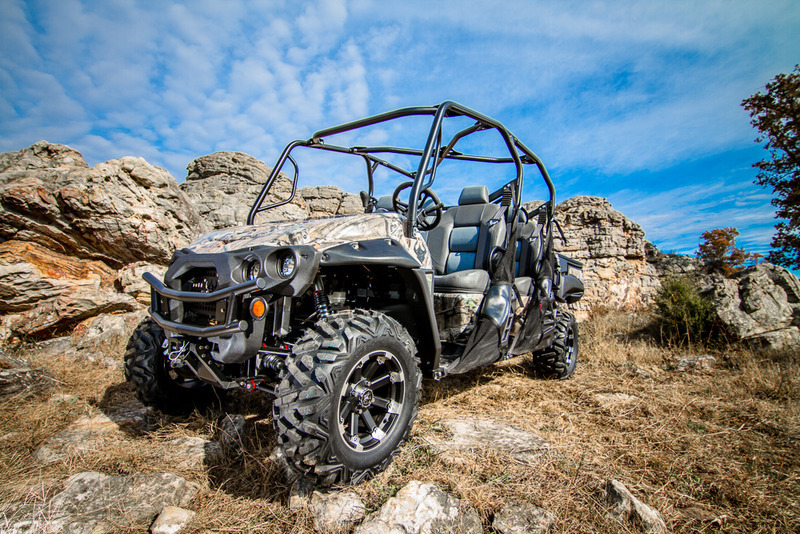 All of our Intimidator UTVs are built to tackle the roughest, toughest terrain. When you pair our 27” tires with 14” aluminum alloy rims (Classic, Crew, and Truck) with our multiple power options, you get a hard working, American-made machine that can take you where you want to go. And for even more power and grit, check out the Intimidator Enforcer ATV Series vehicle. It’s packed with a 4" gear lift, 30% gear reduction, 32" Motoboss 6-ply tires, true beadlock MSA wheels, 18" ground clearance, wide track width, Elka shocks and power steering! Let’s face it. Your truck is not built or designed to take on rocky mountain roads or thick muddy bottoms like a UTV. It’s also a lot cheaper to make repairs to a SXS/UTV. When an axle breaks on your truck, it could be in the shop for weeks on end. However, it’s an easy and not so expensive fix with a side-by-side. Your truck may be great and all, but there are places that it will never go. 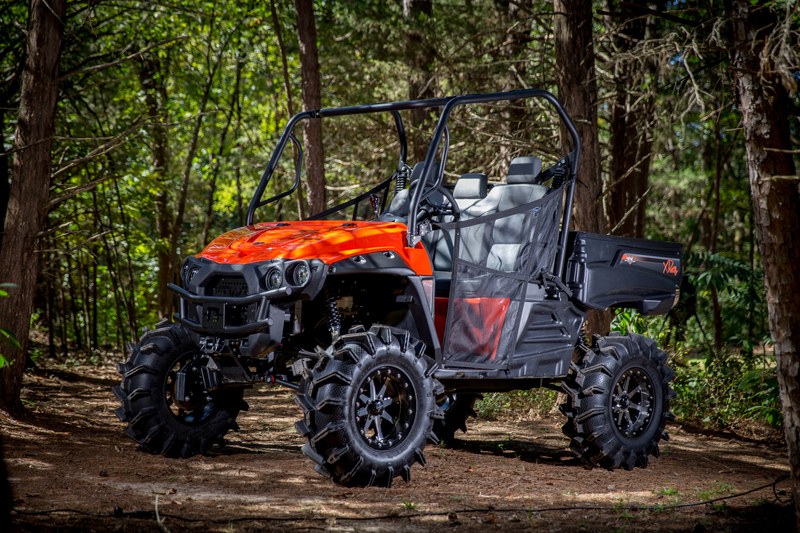 With an Intimidator UTV, it’s easier to get through dense woods and little hide-outs that no one knows exist. Being able to get through smaller openings in trails and go over rocky back-roads gets you where you want to be a little faster. Worried about carrying all of your gear? Don’t be. Whether you decide on the 3-seater Intimidator Classic Series or the 6-seater Intimidator Crew Series, all of our vehicles have enough room to store and carry your gear and your kill. This is great for those who don’t want to carry their prized 10-point buck up and down hills and through creeks. While it is true that you can have your truck painted camo or add a vinyl camo decal, it’s not the same as having our RealTree™ Camo. With the RealTree™ Camo Upgrade, your Intimidator UTV will keep you out of sight and blended perfectly with your surroundings. All of our vehicles are built with high-quality plastics. When you choose the RealTree™ Camo Upgrade, you get a high-definition print that is embedded in the plastic and then formed to shape. It’s not a hydro dip and will NOT peel, flake, or fade. When it comes to hunting, there is nothing better than having an Intimidator UTV by your side. What are you waiting for? Tell your truck adios and get the best of both worlds when you decide to go hunting on your side-by-side. With an Intimidator, you can get to the most remote hunting locations while still having the ability to pack your gear and have a bed to haul your kill for the day. Check out our website, INTIMIDATORUTV.COM, to check out vehicle specs, watch videos, build your own, and more. Want to see these American-made machines up close and in person? Find a local Intimidator UTV Dealer today by using our DEALER LOCATOR.